Public Defenders Hard To Come By In Louisiana A new lawsuit in Louisiana challenges the state's public defense system as unconstitutional. Indigent people there arrested for serious crimes are put on waiting lists to see a public defender. Frederick Bell of Larose, La., says he's received no guidance from a public defender on how to fight drug charges from October. Bell is part of a class action lawsuit against Louisiana's public defender board that charges the public defense system is unconstitutional. 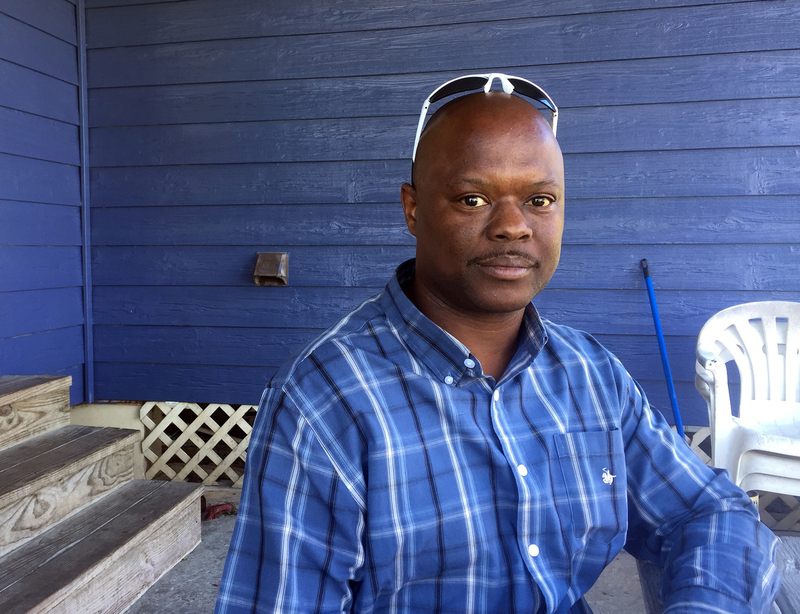 Frederick Bell is one of the plaintiffs in the class action suit. Bell lives "down the bayou" as locals say — in LaFourche Parish, defined by its proximity to the Gulf of Mexico. He does cement work in the oilfield industry, but things are on hold as he awaits trial on a drug charge from last October. Officers say they found drugs in his car during a traffic stop. Bell says he saw the public defender the day after he was arrested, in jail, for about 5 minutes. "That was really just to tell me what I was charged with and how much my bond was," Bell says. They didn't speak again until a court appearance a month later. He says when his name was called, the lawyer told him what prosecutors were offering in exchange for a guilty plea. "I hadn't spoken with anybody about what went down for them to even give me a plea deal," he says. He declined the offer, and his trial was set for April. But just a few weeks out, he still has not discussed his case with a public defender. "I wish my attorney would at least get in touch with me or let me know what's going on," Bell says. "If they do have evidence or if they don't? But no word." Bell and 12 others are suing the governor and the state public defender board in a class action brought by the Southern Poverty Law Center. The lawsuit claims Louisiana's indigent defense system violates both the federal and state constitutions, which affirm the right to legal counsel for poor defendants. I wish my attorney would at least get in touch with me or let me know what's going on. Bell is out on bond, but other plaintiffs have been in jail for months with little or no contact with a lawyer. Bell says he's getting no guidance on how to fight his charges. "To me it's like you got a noose around your neck standing on a 3-legged stool trying to balance yourself cause you don't know what's going on," Bell says. Public defenders say they're performing a balancing act themselves. They handle more than 80 percent of criminal cases in Louisiana. "I'm the only full-time employee with the public defenders' office," explains Rhonda Covington, the public defender for East and West Feliciana — two mostly rural parishes. Covington says she's got 265 open cases. Seven of them are felony life without parole situations, and she also handles juvenile delinquencies, family services and misdemeanors. "Everything from doing 60 in a 55 to first-degree murder, so it's a wide expanse," she says. "And I clean the office." Two part-time paralegals and two part-time contract attorneys help with the load. But there's nothing in the budget for other resources lawyers typically use. "I've got people who are homeless but I don't have a social worker to help me," she says. "I have murder cases that I'm doing my own investigation on because I can't afford an investigator. I need experts. Can't get those." 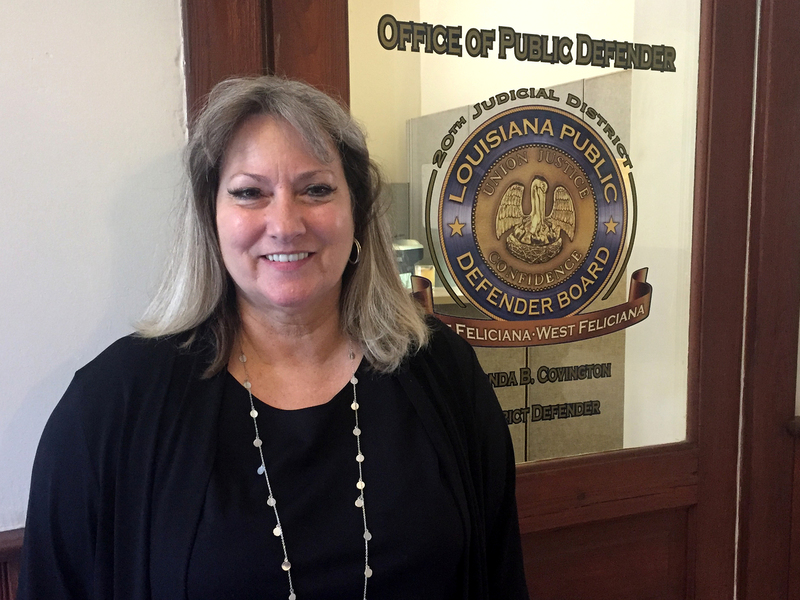 Rhonda Covington is the only full-time employee at the public defender's office for East and West Feliciana parishes in Louisiana. Chronic underfunding for indigent defense has been an issue in Louisiana for decades. But it reached a crisis level last year when the public defender in New Orleans stopped taking new felony cases. People accused of serious crimes were put on a waiting list for a lawyer. When NPR reported on it at the time, public defenders in 12 districts said they couldn't keep up with caseloads. Now 33 of the state's 44 judicial districts are in that position, and Louisiana's chief justice has declared an emergency shortfall in public defense funding. "Public defense is not popular," Covington says. "So politicians do not like it." Covington says her budget is a fraction of what prosecutors get. "People think that criminals have more rights than victims. You hear that a lot," she says. "This is giving rights to people who are accused. They haven't been convicted of anything. They're innocent until proven guilty. That's the American system." At issue is the way Louisiana pays for public defense. While the state provides some money, the system depends primarily on traffic tickets and local court costs, which vary from jurisdiction to jurisdiction, and have nothing to do with the demand for court-appointed lawyers. Louisiana Administrative Commissioner Jay Dardenne says there's no question that there are longstanding challenges funding the system. But he says it's not that the state doesn't want to provide indigent defense as a matter of policy. "We have evidenced a recognition of the state's obligation to provide a portion of the funding in that we have not reduced their funding at a time when we've reduced everything else in state government," Dardenne says. He says with the state facing a nearly billion dollar budget shortfall this fiscal year and next, it's about priorities. "They're competing for state dollars with a lot of other needs that the state has at a time when we're going through a very tumultuous budget experience," he says. Critics say that's no excuse. "The Constitution doesn't accept a budget deficit as a reason not to comply with the Constitution," says Lisa Graybill with the Southern Poverty Law Center, which filed the lawsuit. "When you don't have adequate defense, when you don't have a zealous defense, you really are just running a mill for processing people into prison," Graybill says. Louisiana has the highest incarceration rate in the country, and also one of the highest rates of exonerations. But it's not alone when it comes to a chronic shortage of public defenders. Similar lawsuits have been filed at least six other states. Earlier this year, a Louisiana federal judge threw out a lawsuit brought by the ACLU when the New Orleans office stopped taking new felony clients. But his ruling said it was clear Louisiana is "failing miserably at upholding its obligations" to provide lawyers for defendants who can't afford private counsel. The crisis has judges looking for ways to keep their courts moving. "I started with A's on that with attorneys in the phone book," says Lafayette Judge Patrick Michot. He turned to the private bar, recruiting pro bono lawyers by phone to help defendants who would otherwise be in limbo. "They can't afford a lawyer and nothing is happening with their case and the cases are just piling up and they're not going to trial and these people are giving up their time to come to court," Michot says. Now it's up to a state judge to consider whether Louisiana is living up to its constitutional obligation to provide for indigent defense.